This name derives from the Hebrew "Binyâmı̂yn > Benjâmîn" (Ancient Greek: Beniāmī́n “Βενιᾱμῑ́ν”), meaning “son of the right hand, favored, darling”. The name is also a patronymic surname. 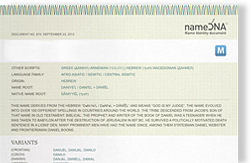 Benjamin was the youngest of the sons of Jacob and Rachel in the Bible and it is popular in the Jewish, Christian and Muslim faiths alike, having many variant forms in other languages. The "Benjamin of the family" is a phrase used in several languages to refer to the youngest son, especially when he is much younger than his brothers. Sometimes the name is chosen for a son born to mature parents unlikely to have more children, especially if he has several older siblings. HELLO BENJAMIN MELPO MENE . Benjamin Of Tudela († 1173), (benjamin Ben Jonah), Traveler, "precursor Of Marco Polo"